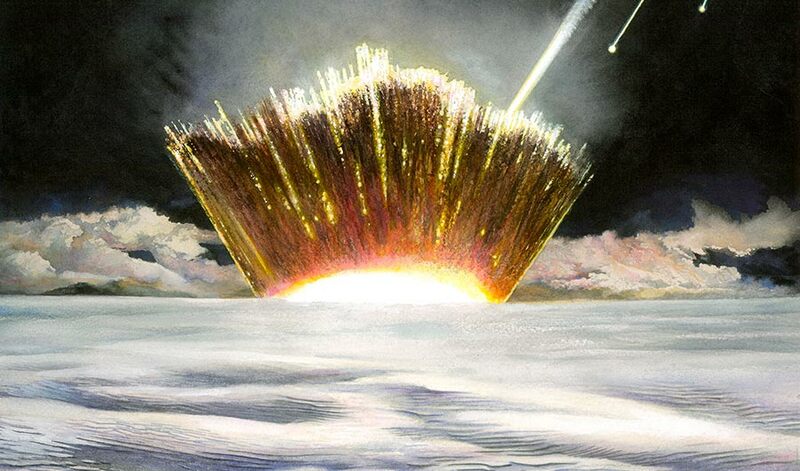 An artist’s depiction of a possible impact into the Greenland Ice Sheet. (Inside Science) -- A crater roughly as broad as the widest part of the Grand Canyon has been found underneath the ice of Greenland. It likely came from a giant cosmic impact that disrupted global climate sometime within our species' history, a new study finds. Ice-penetrating radar analysis of Hiawatha Glacier in northwest Greenland and subsequent additional airborne radar scans revealed a pit roughly 31 kilometers wide under nearly a kilometer of ice. This potentially makes it one of the 25 largest impact craters on Earth, the researchers said. Analysis of sediment samples from a river draining out of Hiawatha Glacier also revealed angular quartz grains that bore signs of shock waves from a giant impact. A number of grains from the samples also consisted of carbon-rich materials and glass that likely formed after a cosmic impact melted minerals in the bedrock. Furthermore, the samples possessed high levels of nickel, cobalt, chromium and gold, signs of a relatively rare iron meteorite. Altogether, these findings are likely evidence of the first impact crater discovered under any of Earth's continental ice sheets, they noted. The scientists estimated the crater formed after an object more than a kilometer wide struck the site. Such a crash would have kicked extraordinary amounts of debris into the sky, triggering major environmental consequences in the Northern Hemisphere or even globally, they said. The precise age of this crater remains uncertain. However, the researchers suggested it formed during the Pleistocene, the epoch spanning from about 2.6 million to 12,000 years ago. This is the same period during which our species, Homo sapiens, spread across the globe. The scientists detailed their findings online Nov. 14 in the journal Science Advances.